LG Electronics South Africa MD Il Hwan Lee has high hopes for the company’s newly launched top-line smartphone, the G2, but does the LG brand have a chance of succeeding in what is already a very crowded Android market? Entering the smartphone category years after Apple and Samsung, LG is hoping to claim a spot as one of the top three smartphones in South Africa in 2014. Lee says that because LG is in the top three position globally — he cites GfK Group data — he believes that the launch of the G2 in South Africa will be the company’s stepping stone to get into the same position locally. Even though LG is a latecomer to the premium handset category, its philosophy for developing new products is to understand what its customers want, and to find out what its competitors’ products are lacking, says Lee. He says LG has brand power thanks to its consumer electronics products, including its televisions and other home appliances, and intends leveraging this as it pushes more aggressively into the smartphone space. Eric Woo, GSM product manager for LG in South Africa, says the company has less than 1% market share locally but believes it can increase this dramatically if the G2 proves a hit. World Wide Worx MD Arthur Goldstuck says the biggest disadvantage that LG has is that it has almost no market share in the smartphone category and no visibility or legacy of being a contender in the space. 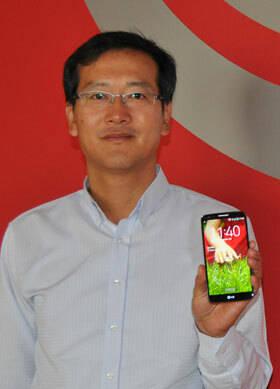 “A year ago, LG had 5% market share and, today, it has 1%, mostly in the low end of the market,” says Goldstuck. He adds that most phones LG has been selling until now are cheap feature devices and it doesn’t have a reputation as smartphone brand of choice. On the other hand, LG has the advantage of being able to start on a clean slate and is able to rebuild from the ground up without having to worry about a legacy and being compared with what it had before. “There are very few people who have used and heard of LG’s Optimus phones, so in retrospect it can close that chapter without anyone paying too much attention,” says Goldstuck. The design came from studying how both left- and right-handed people use their phones over a period of 18 months. They always place their index index finger at the back of their handset and so LG placed buttons on the back of the device, eliminating them from the sides. Goldstuck also mentions that HTC, which has an equally desirable phone at the top end, but has fallen out of the running because it doesn’t have marketing budget to speak of.